In 1997 a talented team, under the request of Steve Jobs, created the slogan of "Think Different." They needed to do something bigger and bolder. The campaign was an enormous success and marked Apple's re-emergence as a powerhouse. "Think Different" started as an advertising campaign but became the theme and high standard for Apple. Apple, Tesla, and Amazon are innovative companies that we follow and admire. They all set themselves apart by doing things differently. Their difference and competitive edge started small, but garnered attention, and grew like wildfire. Consumers realized what they had been settling for, and fell in love with the alternatives provided by these companies. Flashlight Partners also believes that change starts small. Recruiting is an industry with a long history that boomed during WWII. It was a necessary service to compensate for excess vacancies due to the war. The industry continued to grow, throughout the decades, as the job market became more competitive and diversified. Consequently, the role of mainstream search firms has become large and impersonal. Both reactive and transactional. Void of human element. Void of real value. Void of long-term and sustainable results. We want to change that, and we believe we can. We too, want to "Think Different." Constructing Our Future is a community revitalization program dedicated to providing education, housing, and employment to post-incarcerated women in Marion County, Indiana while also mitigating Indianapolis' abandoned home problem. With this program, participants who are released from the Indianapolis Women's Prison are prepared to be independent, law-abiding citizens who give back to the community, one woman, one house, one neighborhood at a time. Laura Latham, CEO of Flashlight Partners, is proud to be a Constructing our Future Partner. She meets with inmates to talk about employment requirements, resume assistance and regulations/policies that could affect their ability to attain work after they are released. Constructing our Future Partners are experts in real estate, trades, HR, government, and other special programs. They give incarcerated women the support they need to reenter society, reduce recidivism, and provide resources. These programs help to promote positive influence and direction for the inmates, all improving their quality of life upon release, mending relationships, and developing success. By working with Constructing Our Future, we begin to promote a society that helps to minimize stigma, eliminate policies that perpetuate repeat offenders and increase the ability for women and their families to thrive after incarceration. 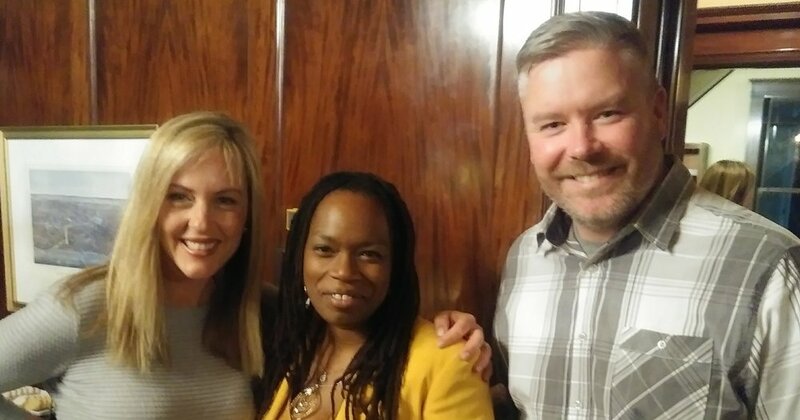 At a recent event "A Night of Inspiration," Laura and her husband, Josh Latham (another Constructing Our Future Partner from Remax Advanced/Indy Pro Teams) met Michelle a former IWP inmate. Michelle served 20 years at IWP and now, in part to her participation in Constructing Our Future, is attending NYU for her Ph.D. in public policy. I have always told my children to live intentionally, and not vicariously. I launched Flashlight to be intentional about my passions, and help others achieve success. This could be a candidate who wants to find a career that is challenging and inspiring, or a client partner looking to build outstanding teams. Teams where intrinsic values and motivations clearly align with professional missions and aspirations. Where personality and culture fit can often trump skills. The leaders in the best organizations know this, and often talk about it. But, the traditional search industry has never quite caught on. If leaders want to stop looking, and focus on building their business, they need to be able to start hiring those uniquely matched with their organizational values, missions and culture. Out of this intention, passion and purpose Flashlight Partners was born. I sought to disrupt the traditional search space, and to become a true partner in pursuit of excellence. To remove transaction and insert collaboration. To offer tailored and customized solutions that provide personalized attention, proven results and include timely communication and open dialogue. 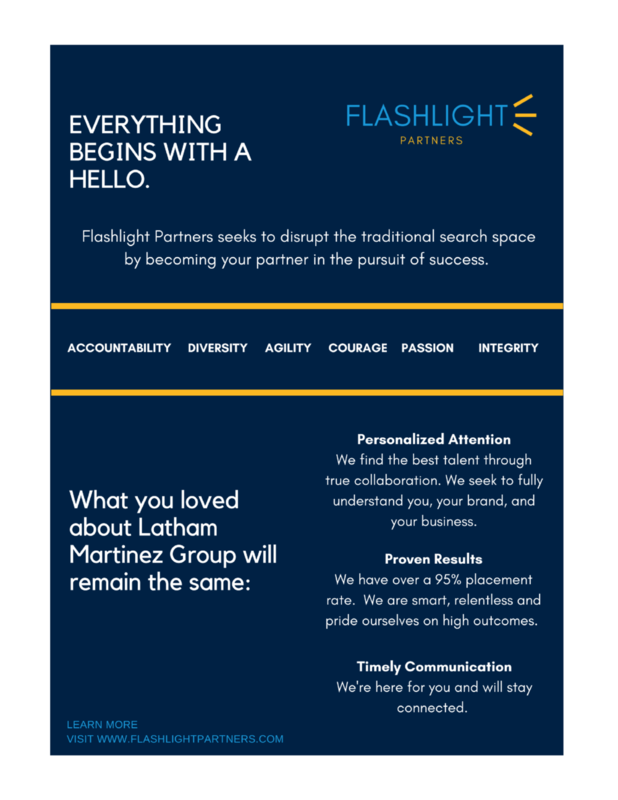 Flashlight leverages over 20 years of executive experience in human resources, recruitment, strategic planning and team building as well as a successful track record of placing thousands of talented professionals globally. We have worked with global enterprise, mid-size, government, family owned, and fast-growth start-ups partners. We are relentless in our pursuit on behalf of our partners. Our purpose is to create success with people and for people. We live our values, and we don’t cut corners. I’ve always believed a recruiter’s work is of great responsibility and impact. Our ability to do our job well is critical to the success of all people involved. If a recruiter does their job poorly, the impact can be costly. Most traditional search firms still think it’s a quotient. A process. A science. But, in reality, is not about how many calls were made, what type of graphs are presented, or how many resumes were shuffled. It is really more of an art. It is a dynamic blend of seeking out relationships, connections, and motivations, with an empathetic and authentic ear. It is about knowing who you serve. Understanding the missions, and asking the right questions. It is about transparency, and communication. It is about reading BETWEEN the lines, and NOT just the lines on a resume. It is not about checking boxes, and critiquing bullet points. I love what I do, but when I’m not working with our extraordinary partners, you can find me cooking up a storm, enjoying time with my amazing husband and four rambunctious kiddos, reading anything I can get my hands on, or volunteering for those less fortunate. I greatly appreciate your shared commitment to building the best teams, and the pursuit of intentional excellence. Flashlight Partners, and I, would be honored to partner with you. As part of our ongoing commitment to your success, we are pleased to debut a brand new name and website. Say hello to Flashlight Partners. We appreciate your commitment to building the best teams, and are honored to be your partner.